Jesus called his disciples together and said to them, "I tell you that this poor widow put more in the offering box than all the others. For the others put in what they had to spare of their riches; but she, poor as she is, put in all she had—she gave all she had to live on." Dan Clark* tells a story from his childhood about a trip to the circus. "Once, when I was a teenager, my father and I were standing in line to buy tickets for the circus. Finally, there was only one family between us and the ticket counter. There were eight children, all probably under the age of 12. You could tell they didn't have a lot of money. Their clothes were not expensive, but they were clean. The children were well-behaved, all of them standing in line. They were excitedly jabbering about the clowns, elephants, and other acts they would see that night. One could sense they had never been to the circus before. It promised to be a highlight of their young lives. The ticket lady asked the father how many tickets he wanted. He proudly responded, "Eight children's tickets and two adult tickets please." The ticket lady quoted the price. The father leaned a little closer and asked, "How much did you say?" The ticket lady again quoted the price. The man didn't have enough money. Seeing what was going on, my dad put his hand in his pocket, pulled out a $20 bill and dropped it on the ground. (We were not wealthy in any sense of the word!) My father reached down, picked up the bill, tapped the man on the shoulder and said, "Excuse me, sir, this fell out of your pocket." The man knew what was going on. He wasn't begging for a handout but certainly appreciated the help in a desperate, heart-breaking, embarrassing situation. He looked straight into my dad's eyes, took my dad's hand in both of his, and squeezed tightly, "Thank you, thank you, sir. This really means a lot to me and my family." My father and I went back to our car and drove home. We didn't go to the circus that night, but we didn't go without." Every now and then you hear of extra ordinary feats of generosity. For no obvious reason people are big-hearted and give liberally to help others out who are facing difficult times. Today’s readings tell us about two women, both widows who demonstrated generosity to the point of sacrifice. In the Gospel reading, Jesus is in Jerusalem. On his way to the cross he visits the temple and observes the rich people dropping their large amounts of money into the offering boxes. In a time when there was no paper money or credit cards, you can imagine the clatter as those rich people emptied their bags of coins into the metal containers for the temple offering. Everyone standing around the temple marvelled at how generously the rich people gave. In amongst all of this, there is an insignificant woman, a widow. She no longer had a husband to look after her. She was the poorest of the poor. It would have been easy to overlook her in amongst that crowd of prominent people who were making quite a show of how much they were giving. But Jesus doesn't ignore her. He sees this widow throw into the offering box the two small copper coins worth about a cent on today’s money and you know what you can buy with a cent. The gospel writer highlights the fact that the widow gave two coins. She could have given just one of the coins and kept the other for herself. It would have been quite easy for her to have argued, "Surely God wouldn’t expect me to give everything," and felt quite justified in giving only one coin. Widows had to beg on the streets for everything they needed. A coin, no matter how small the value, was hard to come by. Every coin was a small fortune. And that’s precisely what Jesus was getting at when he said, "I tell you that this poor widow put more in the offering box than all the others. … She, poor as she is, put in all she had – she gave all she had to live on (Mark 12:44). I can imagine that those in the temple gasped with embarrassment or even sniggered as the poor widow put her 2 small coins in the offering box. There may have even been some comments whispered among the disciples. But Jesus sees things differently. He praises her generosity. He points out that she has given away everything. He implies that she has more understanding of what true giving is all about than all the religious leaders combined. Jesus tells those around him, "She had given all that she had to live on". Her offering, as small as it was and yet at the same as generous it was, demonstrated her love for God. She was excessively and extravagantly generous because she took seriously the command to love the Lord your God with all your heart, with all your soul, with all your mind, and with all your strength (Mark 12:30). 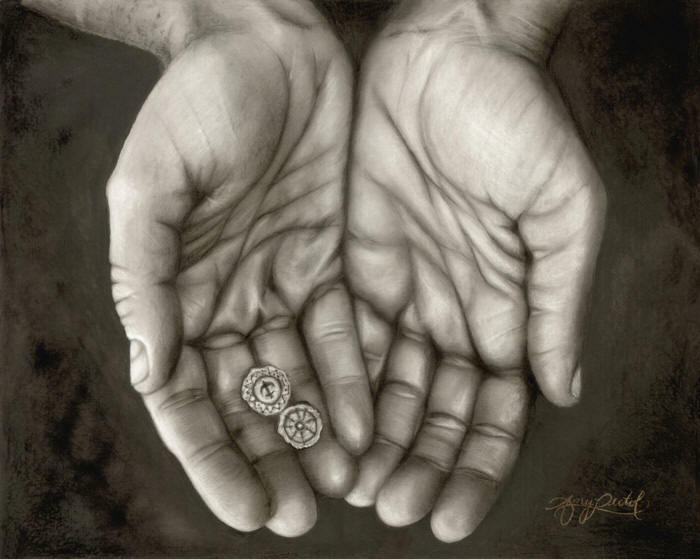 Jesus says her small copper coins represent more love and more understanding of God than the rich who gave lots of money but had little understanding of what it meant to give sacrificially and so generously that they had to rely on God for their next meal. We heard the story of another widow this morning, one who lived a long time before the widow Jesus observed in the temple. A terrible drought had fallen on the whole country and a widow and her son were about to bake their last loaf of bread from the little bit of flour they had left. After they had eaten their last meal, they faced starvation. A stranger arrives - Elijah – who is also very hungry. He makes some weird promise about the flour bowl always having flour in it and the olive oil jar never running out. She could have easily said, "Get real, old man, that’s too weird to be believable. The little bit of food I have left are for my son and myself. Go find your own food". But instead she showed the same generous spirit as the widow in the temple. She trusted God and generously, sacrificially, and unselfishly fed the stranger. She may or may not have known the command to love God with all your heart, soul and mind and love your neighbour as you love yourself but she certainly knew how to put it into practice. The only way we can make any sense of the actions of these two women is to note the sacrifice, the risk, "the leap of faith", their complete surrender to doing what is the will of God, in spite of the fact that many would have called them irresponsible and foolish. A mother wanted to teach her daughter about giving. She gave the little girl a 20 cent coin and a dollar coin for church. "Put whichever one you want on the offering plate and keep the other for yourself," she told the girl. When they were coming out of church, the mother asked her daughter which amount she had given. "Well," said the little girl, "I was going to give the dollar, but just before the collection the man in the pulpit said that we should all be cheerful givers. I knew I'd be a lot more cheerful if I gave the 20 cents, so I did." You might say that about every aspect of dedication to God and sacrifice for others. It’s a lot simpler to take the easy way out. It requires a lot less effort to give a minimum effort than to be generous and sacrificial. There is a lot less pain involved in giving less of our time and money than to go out of our way to be liberal and extravagant. You see it’s not that the widow only gave 2 small coins but that she gave all that she had to live on. That’s where the challenge is for us - to be extravagant with our love, to be excessive in our kindness, to be extreme in our trust, to be generous in offering to God of our time and money. We all know how hard that can be. We all struggle with the kind of generosity and commitment that is being demonstrated by these two women. Sin takes control and we easily become focused on our own needs and ignore God's call to love him with all our heart, soul and mind and love our neighbour as ourselves. The Gospel writer includes this story about an insignificant widow offering so much is part of his explanation of who Jesus is. He is telling us that the insignificant man on the cross has given up everything for the sake of others. The widow gave Elijah everything she had to save a stranger from starving. Jesus gives himself totally to save his enemies, everyone who had sinned in the course of human history. The widow in the temple gave extravagantly because of her love for God. Jesus gave his life so generously because of his love for us. A few days after this incident Jesus was arrested, put on trial, beaten. He gave his life, extravagantly, sacrificially, generously. We may feel that we haven't much in the way of material things, or personal gifts to give to Christ. But if we put what we do have, and what we are, at his disposal, if we were able to take the risk and give of ourselves sacrificially and recklessly, then I believe we will be surprised how the love of Jesus will control what we do and we will witness what great things God can do through us and for us. A woman grew up with no church background. She lived most of her life quite happily with no Jesus, no Christian faith. Then, at age forty-one, in her words, ‘she found Jesus’. She began attending church every time the doors opened. But she did not limit her piety to the church. She began a ministry among the poorest of the city's poor. She began inviting homeless families into her home. Her life was consumed with thoughts of how she might show her love for Jesus. To those who knew her this all seemed bit extravagant. She seemed to be out of control. Perhaps she had come under the control of the One who had released in her energy, vitality, passion and generosity. Jesus tends to do that to some people. Has he ever had that effect on you?